NEW YORK -- The 2018 Winter Olympic Games are being held in South Korea for the first time in three decades and have officially begun. 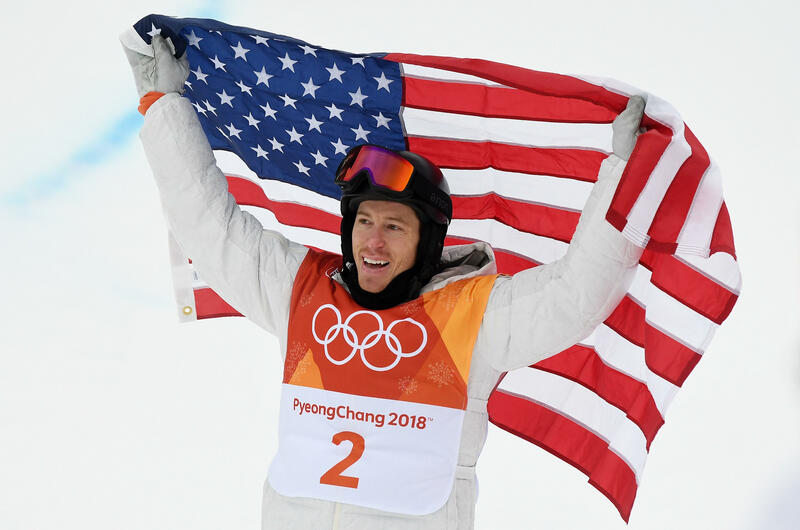 Day five saw the U.S. team acquire their 100th Winter Olympics gold medal when grabbed the gold for his halfpipe performance. Then on day 6, Team USA's Mikaela Shiffrin earned a gold in the women's giant slalom (after having to wait out weather delays). For the Winter Olympics in Pyeongchang, South Korea, NBC and its cable networks will cover popular sports such as figure skating and skiing. Because of the 14-hour time difference, not every Olympic event will be broadcast live. For that, you need to watch an online stream. More than 1,800 hours of online coverage of the games in Pyeongchang begins Wednesday evening in the U.S. with preliminary curling matches. Friday's opening ceremony will be shown live online starting at 6 a.m. ET, and on NBC's prime-time broadcast on a delayed basis at 8 p.m. NBC also plans live streaming of the closing ceremony on Feb. 25. In addition to NBC's over-the-air network, the sports network NBCSN will be the main overflow channel, carrying events such as biathlon, bobsled and luge. Coverage on CNBC and USA Network will be limited to curling and ice hockey. The Olympic Channel will have medal ceremonies, news and highlights, but not event coverage. All four of these cable channels will also be streamed online. Much of the online coverage will come from the International Olympic Committee's Olympic Broadcasting Services. That means the spotlight will be on all athletes, not just Americans. In addition to live events, you can get streams of some training and practice runs. NBC also plans digital-only shows, including a daily two-hour wrap-up starting at noon ET (2 a.m. the next morning in Pyeongchang). Some cable companies plan special features. Comcast, which owns NBC, will include online coverage on its TV set-top boxes and TV coverage on its mobile apps to offer viewers one-stop access to the Olympics. Comcast and other cable providers will also offer the opening ceremony and other events in sharper 4K resolution, though with a day's delay. Here's a list of all the Winter Olympics events on TV this week. All times Eastern. If you've already given up on traditional cable or satellite TV, you can sign up for an online streaming service such as PlayStation Vue or YouTube TV, both of which have free trial periods. To watch online for longer than 30 minutes, you'll still need to be a paying cable or satellite subscriber. As with past Olympics, NBC is requiring proof of a subscription. The subscription requirement also applies to coverage on virtual-reality headsets. For the most part, access to an online TV service -- one that streams many of the channels you'd get from a cable subscription -- will also let you use the NBC apps for streaming and VR. Google's YouTube TV has the lowest price for all five Olympic TV channels, at $35 a month. Google says the service is available in more than 80 U.S. markets, covering more than 80 percent of households, though a local NBC station isn't available everywhere. DirecTV Now also has a $35-a-month offering. But the Olympic Channel is part of a higher tier, at $60 a month, and DirecTV Now generally won't let you record programs for viewing later (a DVR feature is still being tested among some subscribers). Hulu with Live TV is $40 a month for all five channels and DVR. As with Comcast, Hulu is blending TV and online video on its app. PlayStation Vue, Sling TV and FuboTV are all $45 for comparable packages. But you can bring Sling TV's bill down to $30 for just the two main Olympic channels and DVR. PlayStation is $40 without the Olympic Channel. Free trials are available, and you can cancel after the Olympics. Most services let you enter your ZIP code to check whether the NBC station is available. NBC's live broadcast stream won't be available on the NBC app if you don't get the local station. During the Rio Olympics in 2016, VR coverage typically wasn't live and required Samsung's Gear VR headsets with a Samsung phone. This time, VR is available on Google Daydream and Microsoft Mixed Reality headsets as well. Those without a headset can still watch on web browsers or Apple and Android mobile devices. In the U.S., you'll need the NBC Sports VR app. VR isn't meant to replace television. While Intel's VR productions of baseball and other sports had their own announcers, the Olympic coverage will rely on regular television coverage embedded in the VR experience. And most of the VR video will be in 180 degrees -- you'll see the action in front of you and a little bit to the sides, but not what's behind you. Videos in 360 degrees will be limited to non-competition features such as a demo run down the bobsled. Time difference: What time is it in South Korea? The NBC Sports app and the NBCOlympics website offer highlights, interviews and features on athletes without needing a subscription. You'll also have full access to scores, schedules and guides to understanding obscure events. Traditional media organizations will also cover the event, even though extensive video from the official venues are restricted to the rights-holding broadcasters. CBS Sports has an entire section dedicated to full Olympic Coverage, including a full TV schedule. The Associated Press has a Winter Games hub with traditional text, photo and video coverage alongside graphics breaking down complicated moves in figure skating and snowboarding and daily illustrations from sketch artist Dan Archer. The AP will also have 360-degree video and drone views of the venues.